Most scleractinian corals form obligate symbioses with photosynthetic dinoflagellates (family Symbiodiniaceae), which provide differential tolerances to their host. Previously, research has focused on the influence of symbiont composition and the dynamic processes of symbiont repopulation during single episodes of hyperthermal events, followed by years of less-stressful conditions. In contrast, this study characterized for the first time, the role of Symbiodiniaceae species changes in response to annually recurring hyperthermal events, a scenario soon expected to become the norm. Consecutive hyperthermal events during summer 2014 and 2015 along the Florida Reef Tract offered a unique opportunity to study bleaching susceptibility and recovery under recurrent annual hyperthermal scenarios. We utilized Illumina amplicon sequencing of the chloroplast 23S DNA region to assess with fine resolution the Symbiodiniaceae diversity associated with pillar coral, Dendrogyra cylindrus. Our findings show diverse assemblages of Symbiodiniaceae species and that some cryptic members are not transient associates but persistent and ecologically relevant, especially during recurrent annual warming events. This was evidenced by changes in relative abundance from the typically dominant host-specialist endosymbiont, Breviolum dendrogyrum, to B. meandrinium a host-generalist species common to corals in the family Meandrinidae but occurs at background densities in most coral colonies of D. cylindrus. The rise in abundance of B. meandrinium associated strongly with bleaching resistance in the coral host during two consecutive hyperthermal events. In some cases, host-compatible background symbionts can rapidly increase in abundance during episodes of stress and may impart physiological resilience to rapid environmental change and thus, represents a potentially important ecological process by which symbiotic corals acclimatize to changing ocean conditions. Coral reefs worldwide have experienced dramatic declines in recent decades due to natural and anthropogenic factors (Gardner et al., 2003; Van Hooidonk et al., 2016; Hughes et al., 2017). Global impacts of climate change, resulting in hyperthermal coral bleaching events (loss of symbiotic photosynthetic algae and/or chlorophyll), have become more frequent in recent decades and are projected to be annual events by 2050, or sooner on some reefs (Hoegh-Guldberg et al., 2007; Van Hooidonk et al., 2015, 2016). One of the strongest El Niño Southern Oscillation (ENSO) events on record occurred from May 2014 to June 2016 (Lian et al., 2017), causing staggering losses to coral reefs worldwide, including the Florida Reef Tract, due to consecutive bleaching events and subsequent disease outbreaks (Precht et al., 2016; Hughes et al., 2017). Most scleractinian corals form obligate symbiotic relationships with photosynthetic dinoflagellates within the family Symbiodiniaceae. This partnership is critical for coral health and vital to enhanced calcification in reef-building corals (Muscatine and Porter, 1977; Mallela, 2013). Understanding the role of Symbiodiniaceae diversity in bleaching susceptibility and recovery, and the physiological constraints and advantages they confer on their coral hosts has become of increasing importance with escalating climate change (Cunning and Baker, 2012; Silverstein et al., 2012; Logan et al., 2014). Currently there are seven described genera and a similar number of other divergent lineages requiring generic names (LaJeunesse et al., 2018). Inter- and intra-generic diversity displays clear physiological differences (Rodriguez-Lanetty et al., 2004, 2006; Rodriguez-Lanetty, 2003; Rowan, 2004; Warner et al., 2006; Abrego et al., 2008; Sampayo et al., 2008; Fitt et al., 2009) and provides differential environmental tolerances and sensitivities to the symbiotic partnership (Jones and Berkelmans, 2010; LaJeunesse et al., 2014; Hume et al., 2015). Seminal work by Berkelmans and Van Oppen (2006) demonstrated experimentally that corals can acquire increased thermal tolerance as a direct result of changes in the symbiont genus dominating their tissues by shuffling existing types already present within the coral host. Molecular approaches to Symbiodiniaceae diversity and community assemblages now allow us to further investigate the functional significance of genetic diversity within genera, thus prompting further questions into the roles of the symbionts during environmental stressors (Sampayo et al., 2008; Bay et al., 2016). Using higher resolution DNA markers, it has become apparent that there is a very large number of species in this family (Rodriguez-Lanetty et al., 2001, 2004; Rodriguez-Lanetty, 2003; LaJeunesse, 2002; Sampayo et al., 2009; LaJeunesse and Thornhill, 2011; Thornhill et al., 2014; Wilkinson et al., 2015; Lewis et al., 2018). Additionally, advances in high-throughput amplicon sequencing technology have allowed fine-scale exploration of the Symbiodiniaceae community composition by discovering more cryptic, previously undetected symbiont types occurring at abundances less than 0.01% (Arif et al., 2014; Green et al., 2014; Quigley et al., 2014; Thomas et al., 2014; Boulotte et al., 2016; Cunning et al., 2017). While various kinds of Symbiodiniaceae can be detected in trace amounts from host tissues, interpreting the ecological and functional significance of these requires caution (Lee et al., 2016). Still reef corals are often compatible with more than one symbiont species and differences in their physiological tolerances may shift population dynamics allowing for a symbiont at low abundances to proliferate within the coral animal thus changing the composition of the symbiont population to one that is better adapted to prevailing environmental conditions (Berkelmans and Van Oppen, 2006; LaJeunesse et al., 2009a; Baums et al., 2014; Grottoli et al., 2014; Parkinson and Baums, 2014). Studies conducted over the last two decades have been fundamental in gauging the response and the ability of corals to acclimatize to increased temperature extremes under scenarios in which isolated thermal anomalies have been followed by years of non-bleaching temperatures. However, the 2014–2016 ENSO phenomenon led to a recurrent thermal stress scenario, resulting in mass coral bleaching which detrimentally impacted coral reefs worldwide, including the Florida Reef Tract, during the summers of 2014 and 2015 (Manzello, 2015). These consecutive hyperthermal events, not experienced on Florida’s reefs since the 1997-1998 ENSO (Causey, 2001), offered a unique opportunity to document spatial and temporal bleaching and post-bleaching recovery under conditions not frequently seen, but expected to become the norm in the near future based on current predictions (Hoegh-Guldberg et al., 2007; Altizer et al., 2013; Van Hooidonk et al., 2016). 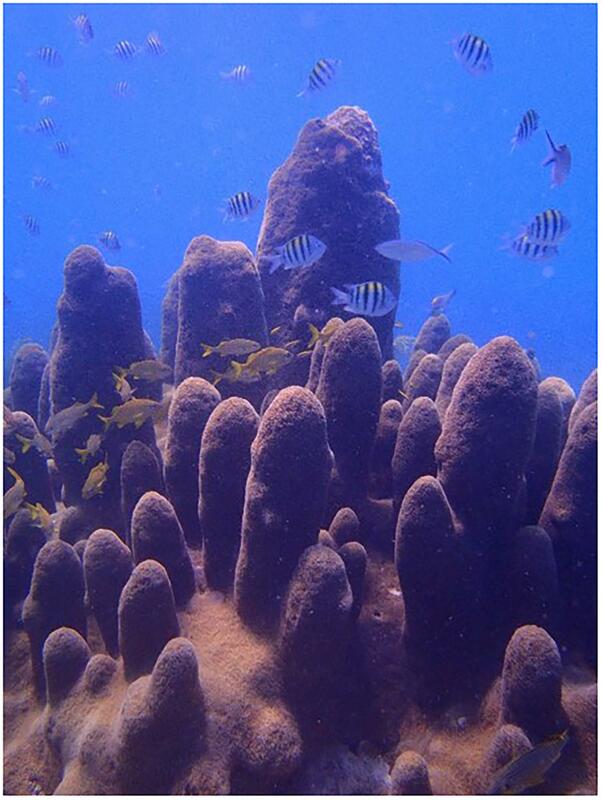 This study targeted the rare and iconic pillar coral, Dendrogyra cylindrus (Ehrenburg, 1834), a slow-growing columnar species typically found in low abundance throughout its Caribbean range (Figure 1). This species is currently categorized as ‘vulnerable’ under the International Union for Conservation of Nature (IUCN) Red List criteria (Aronson et al., 2008) and listed as ‘threatened’ under the US Endangered Species Act (NOAA Fisheries, 2014) due to its susceptibility to bleaching, disease, and habitat degradation. We focused on three representative sites distributed geographically along the Florida Reef Tract (Figure 2). For this study we used Illumina amplicon sequencing of the chloroplast 23S hyper-variable region (cp23S-HV) to characterize for the first time with fine resolution, the Symbiodiniaceae community assemblage associated with D. cylindrus colonies at three sites and their temporal dynamics through recurrent hyperthermal events over a 2-year period. We detected the presence of low abundance background Symbiodiniaceae genera and, at one location, observed changes in the symbiont population from the normal host-specialist species, Breviolum dendrogyrum, to a sibling species, B. meandrinium, common to corals across the family Meandrinidae. The dramatic increase in abundance of this species corresponded to enhanced colony recovery from bleaching and resistance to consecutive hyperthermal events. Figure 1. The iconic pillar coral, Dendrogyra cylindrus. This unique species occurs in historically low abundance throughout the Greater Caribbean. Its unique columnar structure provides important habitat complexity to the reef ecosystem where it does occur (Photo: C. Lewis). Figure 2. Study sites on the Florida Reef Tract where monitoring and sampling was conducted on the Pillar Coral Dendrogyra cylindrus. Geographically stratified tri-annual monitoring and sampling occurred at 28 sites April 2014 to April 2016 (yellow circles). 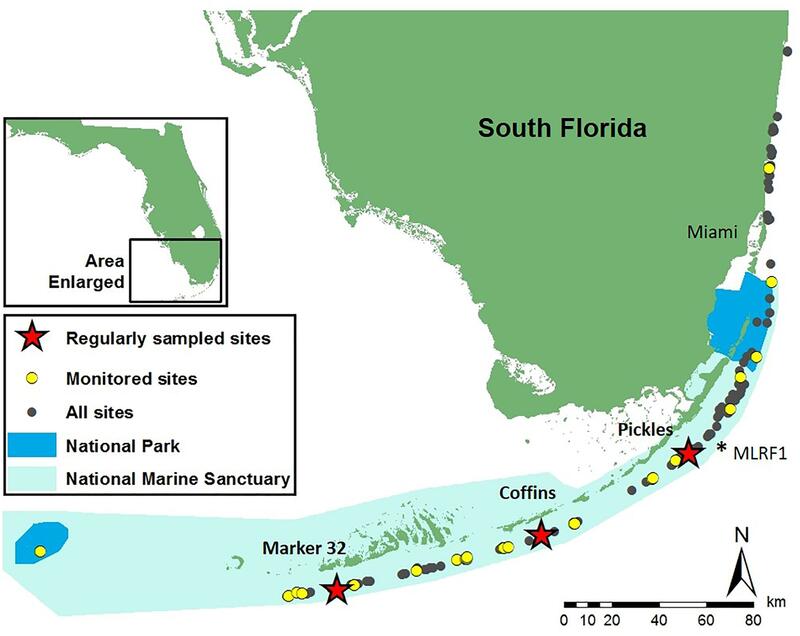 Pickles (Upper Keys), Coffins (Middle Keys), and Marker 32 (Lower Keys) sites (red stars) were monitored and sampled monthly during bleaching recovery in 2014 and 2015. ∗MLRF1 – location of Molasses Reef C-man buoy used to calculate 10-year mean monthly temperatures. Geographically stratified monitoring and field sampling of 163 D. cylindrus at 29 sites across the Florida Reef Tract (FRT), conducted every 4 months from April 2014 to April 2016, allowed for comparison before, during and after the occurrence of two consecutive hyperthermal bleaching events in 2014 and 2015. Three of these sites (Pickles: Upper Keys, N = 107 colonies; Coffins: Middle Keys, N = 55 colonies; Marker 32: Lower Keys, N = 16 colonies; represented by stars in Figure 2) were selected spatially to represent each region and logistically due to the greater number of D. cylindrus colonies present at each site for replication of observations. These sites were targeted for more frequent sampling to more closely observe changes during bleaching and recovery (2014: September, October, November, and December; 2015: January, March, April, September, October, and November; and 2016: January and April). Sites ranged in depth from 4 to 8 m. Colonies at all sites were mapped and photographed to create field identification sheets for each colony to facilitate accurate repeat assessment and sampling. Pendant data loggers (Onset HOBO Inc., Bourne, MA, United States), secured to the base of colonies at Pickles, Coffins, and Marker 32 sites, recorded hourly temperatures between April 2014 and April 2016 (Figure 3). Temperature data was used to calculate mean daily, mean monthly, and maximum weekly sea temperatures at each site. Archived temperature data for 2004–2013 at Molasses Reef C-MAN station MLRF1, located in the Upper Keys 4.2 km from Pickles site (NOAA National Data Buoy Center, 2016), was used as a proxy to calculate 10-year mean monthly and mean monthly maximum sea temperatures on the FRT (Supplementary Table 1B). Using the calculated mean monthly maximum temperatures at MRLF1, degree heating weeks (°C-weeks) were calculated for each site for July, August, and September 2014 and 2015 (Liu et al., 2006) (Supplementary Table 1A). Figure 3. Water temperatures at three sites in the Florida Keys recorded between April 2014 and April 2016. The Florida Reef Tract (FRT) in the Florida Keys is divided into distinct regions based on hydrologic influences, represented here by three sites: Pickles, Upper Keys; Coffins, Middle Keys; and Marker 32, Lower Keys. Red dashed lines indicate the local bleaching threshold for the FRT (30.5°C). Gaps in data are due to lost or damaged temperature loggers. (A) Mean monthly water temperature data. 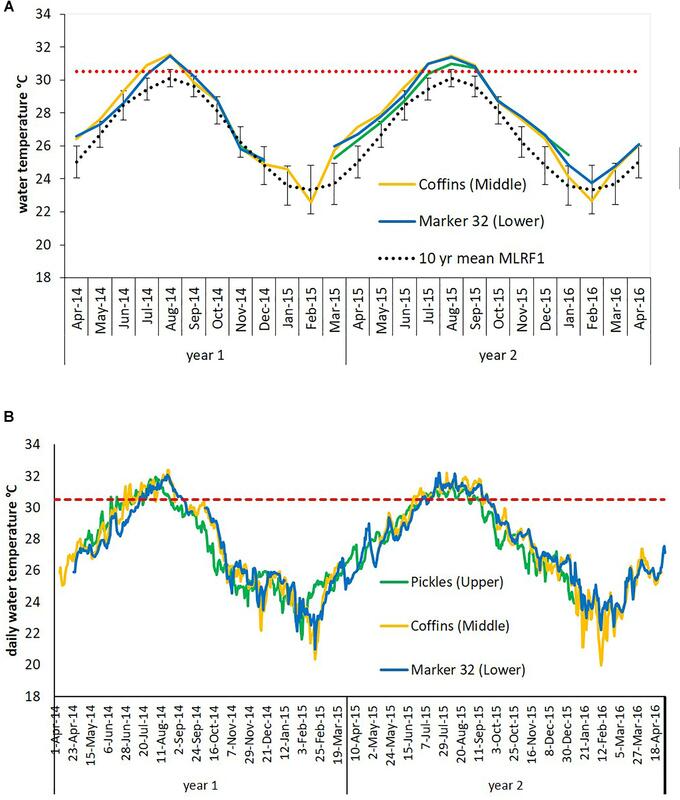 Dotted black line is the calculated 10-year mean monthly water temperature (error bars ±1 SD) for Molasses Reef 2004-2013 (MLRF1, National Data Buoy Center). (B) Mean daily water temperature data. At each sampling time point, D. cylindrus colonies were assessed for live coral tissue (visual estimate of percent live, percent old mortality, percent recent mortality, i.e., bright white, recently exposed skeleton), and coral bleaching status. Colony color scores were assigned using the CoralWatch Coral Health colorimetric chart developed by Siebeck et al. (2006) and scaled from 1 (white) to 6 (heavily pigmented; Supplementary Figure 1), served as a proxy for symbiont density and chlorophyll a content. The CoralWatch Health Chart was not utilized as a color reference until September 2014, therefore, colony coloration scores for April 2014 were estimated after reviewing colony photos. Colonies were sampled at each time point using a low-impact syringe micro-sampling technique (Kemp et al., 2008) to minimize damage to the colonies from repeated sampling (sampling: Pickles n = 10 colonies, Coffins n = 10 colonies, Marker 32 n = 12 colonies). Briefly, tissue from three to five polyps per colony was aspirated using a 30 cc syringe, transported back to shore on ice, then filtered through a 13 mm Swinnex filter system (Millepore Corporation, Billerica, MA, United States), using a 3.0 μm filter disk (A/D glass fiber filter, Pall Corporation, Port Washington, NY, United States). Each filter disk was preserved in 95% molecular grade ethanol. DNA was extracted using modified DNeasy Plant Mini kit protocols (Quiagen Corporation, Valencia, CA, United States) (LaJeunesse, 2002). Briefly, half of each sample filter was placed in 400 μl supplied lysing buffer and ground with a sterile pestle. Sterile acid-washed glass beads (425–600 μm; Sigma-Aldrich, Saint Louis, MO, United States) were added and shaken for 3–5 min to disrupt symbiont cell walls, followed by the addition of 20 μl proteinase K (Promega Corporation, Madison, WI, United States) and incubated at 56°C for 1–2 h. Standard kit protocols were then followed for the remainder of the extraction. Amplicon sequencing diversity assays of the Symbiodiniaceae communities was performed on Illumina MiSeq platform with 2 × 300 base pairs paired-end read capability, utilizing length variation in Domain V of large sub-unit rDNA chloroplast 23S hyper-variable region (cp-23S-HV, Santos et al., 2003; Supplementary Table 2) at the Molecular Research LP sequencing facility (MR DNA; Shallowater, TX, United States). Resulting raw sequence data (Read1 & Read2.fastq file format) were processed using MR DNA pipeline analysis. Briefly, paired-end sequence reads (r1 and r2) were joined after quality control (Q25) trimming of the ends, barcoding was removed, and sequences with <150 base pair overlap were discarded. Remaining sequences were de-noised, OTUs were generated, and chimera sequences were removed. Clustering of OTUs was determined at 97% similarity (3% divergence) across all samples. Resulting OTUs were taxonomically classified using BLASTn against a selected database created from cp23S Symbiodiniaceae sequence data from NCBI1 to determine relative abundance of Symbiodiniaceae types in D. cylindrus. To confirm identities of the most abundant OTUs, a BLAST-search of GenBank was performed2. Further identification of the two most abundant B1 symbiont type OTUs was independently verified using Symbiodiniaceae microsatellite analysis (B7Sym15 primers, Supplementary Table 2) (Pettay and Lajeunesse, 2007). Briefly, selected samples (dominant OTU ≥ 70% relative abundance) were PCR-amplified using the B7Sym15 primers and visualized on ABI 3100 Genetic Analyzer. Peaks were identified in each sample and compared to known Symbiodiniaceae samples in the LaJeunesse Lab (Lewis et al., 2018). 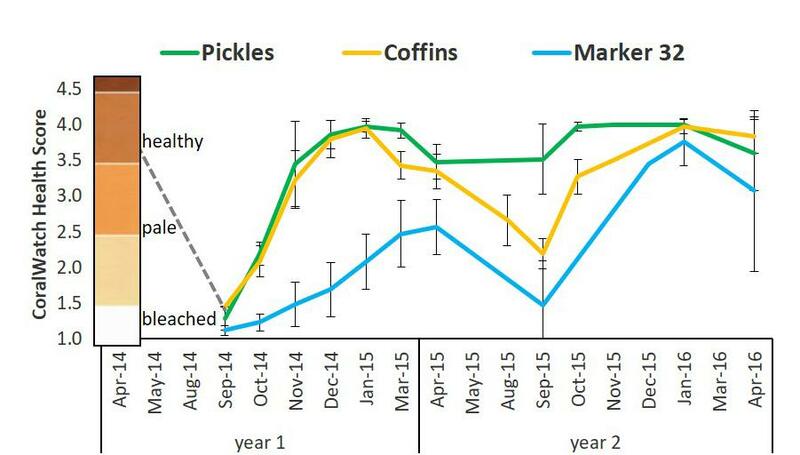 Repeated measures analysis of variance (repeated measures ANOVA, α = 0.05) was used to compare water temperature profiles between the three sites (Pickles, Coffins, and Marker 32) through two consecutive bleaching and recovery periods April 2014 through April 2016. CoralWatch bleaching scores for colonies at the three sites were also analyzed, using repeated measures ANOVA with post hoc Tukey and Bonferroni correction (α = 0.05; Pickles n = 10, Coffins n = 10, Marker 32 n = 12), to compare bleaching and recovery differences between sites and between years. To determine the relationships between coral bleaching and changes in the Symbiodiniaceae community between sites, multivariate analysis of variance (MANOVA α = 0.05) was used to compare colony bleaching index (colony scores) to the relative abundance of OTUs generated by amplicon sequencing of the cp23S-HV region (Pickles n = 6, Coffins n = 6, Marker 32 n = 6). Illumina amplicon sequencing of the cp23S-HV gene region showed a single OTU (or phylogenetic species) within the genus Breviolum (formerly clade B; (LaJeunesse et al., 2018) to be the dominant Symbiodiniaceae in D. cylindrus pre-bleaching (April 2014), ranging from 75 to 81% relative abundance across sites (Supplementary Table 3). Members within Symbiodinium, Cladocopium, and Durusdinium (formerly clades A, C, and D respectively; (LaJeunesse et al., 2018) were also detected in cryptic low abundance (<0.1%). Amplicon diversity analysis yielded 266 OTUs (0.97% similarity cut-off). All but fourteen OTUs were taxonomically classified as genus Breviolum (formerly clade B Symbiodinium). Moreover, the combined relative abundance of all 252 Breviolum OTUs represented > 99% of the Symbiodiniaceae community at all three representative sites along the Florida Reef Tract (Pickles, Coffins, and Marker 32). Two hundred thirty-two Breviolum OTUs were rare members of the Symbiodiniaceae community detected at <0.01% relative abundance. The two most abundant OTUs accounted for >80% of the symbiont community at all three sites. These two sequences were both identified as sub-genera Breviolum type cp-23S B184 (or ITS2 type B1) phylotypes in GeneBank. Using Symbiodiniaceae microsatellite analysis (B7Sym15 primers, Supplementary Table 2), the identity of these two sequences was verified as ITS2 types B1-4k and B1-3 (species novo: Breviolum dendrogyrum and B. meandrinium, respectively; LaJeunesse et al., 2018; Lewis et al., 2018). There was no difference in relative abundances of B. dendrogyrum or B. meandrinium compared between sites in April 2014 prior to bleaching (two-way ANOVA α = 0.05, p > 0.05). Ninety-four OTUs belonging to the genus Symbiodinium (formerly clade A) were detected in cryptic low abundance at Pickles, Coffins, and Marker 32 in April 2014 (Supplementary Table 3). These OTUs were confirmed by BLAST-search as belonging to Symbiodinium strains A2, A3, and A13 (strain A13, putatively S. necroappetens). Three cryptic Cladocopium OTUs (formerly clade C) were detected only at Pickles and Marker 32 sites. A single OTU, classified as Durusdinium (strain D1a, putatively D. trenchii), was only detected at Marker 32 in April 2014. Florida’s reefs exceeded 5°C-weeks (degree heating weeks) during the summers of 2014 and 7°C-weeks in 2015, based on NOAA’s Coral Reef Watch 50-km Satellite Monitoring (NOAA Coral Reef Watch, 2000), updated twice-weekly; NOAA OSPO, 2018) (Supplementary Table 1A). Data loggers at the three study sites recorded sea water temperatures which exceeded the FRT bleaching index of 30.5°C (Manzello, 2015) (Figure 3), causing severe bleaching in most coral species across the FRT (personal observation and Precht et al., 2016). Maximum weekly temperatures in 2014 exceeded the FRT bleaching threshold (30.5°C) 10 weeks at Coffins and 8 weeks at Marker 32 (Figure 3 and Supplementary Table 1B). Data loggers were lost at the Pickles site from April to September 2014 and thus meaningful temperature analysis could not be included. In 2015, maximum weekly temperatures exceeded the bleaching threshold 12 weeks at Pickles and 13 weeks at both Coffins and Marker 32. Using mean maximum monthly calculations from MRLF1, degree heating weeks at Coffins (Middle Keys) exceeded 7°C-weeks in 2014 and 5°C-weeks in 2015 (Supplementary Table 1B). Degree heating weeks at Marker 32 (Lower Keys) was nearly 3°C-weeks in 2014 and 4°C-weeks in 2015. Degree heating weeks at Pickles (Upper Keys) was 0°C-weeks in 2015 (no data from 2014). Utilizing the FRT bleaching threshold (30.5°C), calculated DHW was greater at the three sites (Supplementary Table 1B). The number of weeks maximum water temperatures exceeded the bleaching threshold were greater in 2015. 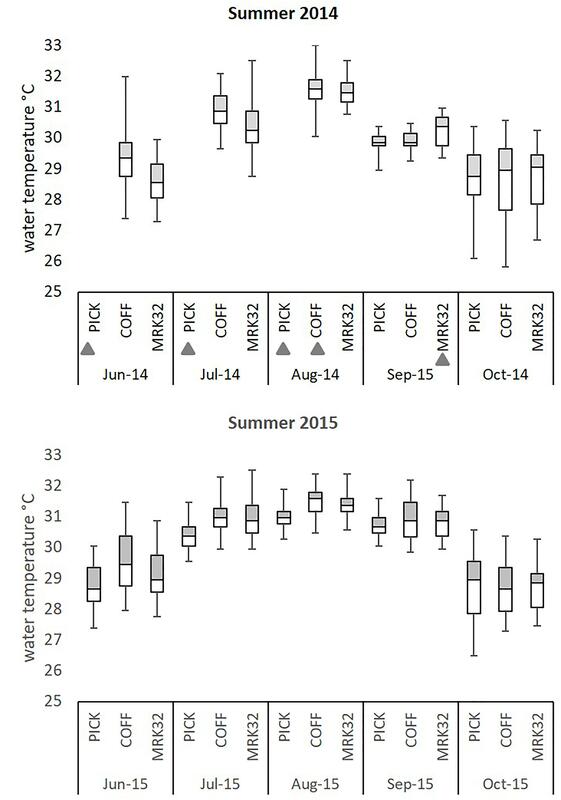 Summary of water temperatures from June through October (i.e., warmest summer months) in 2014 and 2015 show differences in temperature characteristics between sites and between years (Figure 4; repeated measures ANOVA p < 0.04), except for July 2015 (p = 0.076). While all sites experienced temperatures exceeding the bleaching threshold, Coffins experienced the highest temperatures in August 2014, however, Marker 32 was warmer (maximum and median temperatures) than the other two sites in September 2014 (p < 0.01). During the second hyperthermal event in 2015, Coffins and Marker 32 sites experienced warmer temperatures than Pickles site (maximum and median temperatures; p < 0.01). Figure 4. Summary of water temperature profiles at three sites on the Florida Reef Tract during summer 2014 and 2015. Five-number summary of temperature profiles at three sites (Pickles: Upper, Coffins: Middle, Marker 32: Lower) along the Florida Reef Tract. Hourly water temperatures from pendant data loggers were used to create temperature profiles from June through October 2014 and 2015. Box plots indicate interquartile temperature ranges (Q2–Q3) and median temperatures. ‘Whiskers’ show maximum and minimum water temperature during this time period. Gray triangles indicate incomplete temperature profiles due to lost data loggers. The CoralWatch Coral Health colorimetric chart developed by Siebeck et al. (2006) was used to determine the bleaching status of colonies. Healthy, non-thermally stressed colonies ranged in color between 3.5 and 4.5 on this chart (Supplementary Figure 1). Colonies with scores between 1.5 and 3.5 were considered pale, while colonies with scores < 1.5 were considered bleached. In response to hyperthermal events in 2014 and 2015, patterns of bleaching and recovery differed between sites as well as between years. During the first bleaching event on the FRT (August–September 2014), all D. cylindrus colonies, including at Pickles, Coffins, and Marker 32 sites were severely bleached (Figure 5 and Supplementary Table 4). Colonies at Marker 32 were the most severely bleached, followed by Coffins colonies and finally Pickles (two-way ANOVA; p < 0.01). Pickles and Coffins colonies regained normal coloration by December 2014 and January 2015. From January to April 2015, colonies at these two sites paled (two-way ANOVA, p < 0.01). Marker 32 colonies recovered slowly, remaining pale through April 2015 (Figure 5 and Supplementary Table 4). Figure 5. Mean bleaching index based on coloration scores of D. cylindrus colonies at three sites on the FRT between 2014 and 2016. The coloration scores were determined using the CoralWatch Coral Health Chart for colorimetric reference (version: Project Aware https://coralwatch.org; Siebeck et al., 2006). Coloration ranges for D. cylindrus based on triannual assessments of 168 colonies: healthy 3.5–4.0; pale: 2.0–3.0; bleached: 1.0–1.5. Dashed gray line represents trajectory of estimated colony scores from April 2014. Pickles (n = 12) Upper Keys; Coffins (n = 12) Middle Keys; Marker 32 (n = 11) Lower Keys. Error bars ± 1 standard deviation. During the second hyperthermal event in August-September 2015, site-specific differences in bleaching and recovery were observed. Colonies at Coffins and Marker 32 again bleached, although Coffins colonies were less severely bleached than September 2014, indicated by higher coloration scores (two-way ANOVA, p < 0.01; Figure 5 and Supplementary Table 4). However, unlike these two sites, Pickles colonies were more resistant to bleaching in 2015, with no significant change in colony coloration from April to September 2015 (two-way ANOVA, p = 0.82). While there was no bleaching observed in these colonies during the hyperthermal event, there was an increase in colony coloration from September to October (p = 0.01) which remained constant through January 2016 (Figure 5 and Supplementary Table 4). Coffins colonies also recovered normal coloration by January 2016. Both Pickles and Coffins colonies again paled during the 2016 winter-spring transition (p = 0.01). Although many colonies at Marker 32 remined pale after September 2015, they appeared to recover slightly when compared with the previous year, indicated by near-normal coloration scores in November 2015 and January 2016 (mean scores: 3.46 ± 0.33 and 3.76 ± 0.33; two-way ANOVA, p < 0.01). Colonies at Marker 32 were considered pale again in April 2016 (mean score: 3.01 ± 1.13; one-way ANOVA p = 0.06; Figure 5 and Supplementary Table 4). The Symbiodiniaceae community in D. cylindrus was dynamic in response to hyperthermal bleaching and the subsequent recovery processes following two consecutive bleaching events. Relative abundance of the endosymbionts varied between three representative sites, especially the two species within Breviolum described above (Figure 6). At the Pickles site (Upper Keys) and associated with the August-September 2014 hyperthermal event, previously cryptic B. meandrinium (<10% relative abundance) became the dominant endosymbiont species in October 2014 and persisted through April 2015 while B. dendrogyrum declined in relative abundance through December 2014 to 20.60% but then slowly increased to 33.35% through April 2015 (Figure 6A and Supplementary Table 3A), but not to pre-bleaching abundance of 75.68% in April 2014. At the Coffins site (Middle Keys), B. dendrogyrum remained dominant through bleaching and recovery in 2014. Breviolum meandrinium remained at low abundance but showed a slight but significant increase from October to December 2014 (two-way ANOVA p = 0.01), reaching maximum 20.15% relative abundance in April 2015 (Figure 6B and Supplementary Table 3B). Similar to the Coffins site, B. dendrogyrum remained the dominant species at Marker 32 (Lower Keys; Figure 6C and Supplementary Table 3C). Figure 6. Relative abundance of Symbiodiniaceae symbionts from the genus Breviolum associated with D. cylindrus on the Florida Reef Tract between 2014 and 2016. The dynamics of Breviolum dendrogyrum (blue) and B. meandrinium (green) between three sites and between years, by percent relative abundance of Breviolum spp. OTUs. B. meandrinium increased in relative abundance during bleaching and recovery, becoming the dominant symbiont species at the Pickles site in 2014 and 2015. (A) Pickles (n = 6) Upper Keys, (B) Coffins (n = 6) Middle Keys, (C) Marker 32 (n = 6) Lower Keys. ‘All other Breviolum’ (blue-gray) represents 250 OTUs combined. Asterisk (∗) indicates bleaching months. In response to the second hyperthermal event in August-September 2015, the two most abundant Breviolum species were again dynamic and site-specific. At the Pickles site, fluctuation in dominance was again detected in which B. dendrogyrum briefly increased in abundance and re-established dominance by September 2015 (53.41%; two-way ANOVA, p = 0.02) however, this was short-lived. Relative abundance of B. meandrinium slowly declined through September 2015 to 30.28% but then quickly increased during the recovery months to persist as the dominant endosymbiont through April 2016 (51.55%). From September 2015 to April 2016, B. dendrogyrum slowly declined to 29.97% (Figure 6A and Supplementary Table 3A). 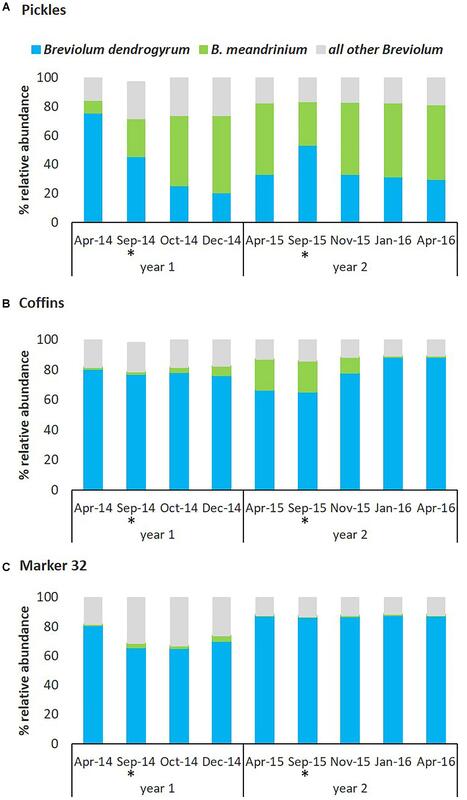 At the Coffins site, B. dendrogyrum remained the dominant species throughout the second bleaching and recovery (2015) and returned to similar abundance observed in April 2014 baseline (Figure 6B and Supplementary Table 3B). Breviolum meandrinium reached a maximum abundance of 20.39% in September 2015 at this site and declined to 0.12% in January 2016, remaining unchanged through April 2016 (two-way ANOVA, p < 0.01). And finally, at the Marker 32 site, relative abundance of B. dendrogyrum and B. meandrinium did not change from April to September 2015 or thereafter, and B. meandrinium remained cryptic (<0.1% abundance) through April 2016 (Figure 6C and Supplementary Table 3C). The magnitude of change in relative abundance of dominant Breviolum dendrogyrum and cryptic B. meandrinium during two consecutive hyperthermal bleaching events was site specific and closely associated with differential resistance and resilience to bleaching and recovery. Colonies at the Pickles site (Upper Keys) bleached severely during August-September 2014 and then recovered by December 2014 (Figure 5 and Supplementary Table 4). Concurrently, the relative abundance of dominant endosymbiont B. dendrogyrum declined while cryptic B. meandrinium increased to become the dominant symbiont. Relative abundance of these two species did not return to pre-bleaching levels (Figure 6A and Supplementary Table 3A). During the second hyperthermal event in August-September 2015, while B. dendrogyrum briefly regained dominance by September, B. meandrinium once again became the dominant species, persisting through recovery until April 2016. This change was closely associated with the observation that colonies at Pickles did not bleach during the second hyperthermal event (Figure 5 and Supplementary Table 4), indicating acquired resistance to annual thermal stress (water temperatures exceeding 30.5°C, Figures 3, 4). This resistance was strongly associated with a fluctuation in Symbiodiniaceae species, specifically an increase and persistence in abundance of B. meandrinium as it became the dominant species in D. cylindrus colonies at the Pickles site (MANOVA p < 0.001). Colonies at the Coffins site (Middle Keys) also bleached severely in August-September 2014 (Figure 5 and Supplementary Table 4). As normal colony coloration returned in December 2014, cryptic B. meandrinium slightly increased in abundance, reaching 20.15% by April 2015 (Figure 6B and Supplementary Table 3B). Although B. meandrinium never became the dominant Breviolum species at Coffins, colonies did not bleach as severely the second year and recovered quickly to normal coloration by January 2016 (Figure 5 and Supplementary Table 4). This strongly suggests at least partial resistance to bleaching associated with an increased relative abundance in cryptic B. meandrinium (MANOVA p = 0.068). Colonies at Marker 32 (Lower Keys) bleached severely both in 2014 and 2015 (Figure 5 and Supplementary Table 4) while B. meandrinium remained at cryptic low levels throughout, reaching a maximum abundance of only 2.60% in September 2014 (Figure 6C and Supplementary Table 3C; MANOVA, p = 0.981). Although Breviolum (formerly clade B) remained the dominant genus in D. cylindrus through two consecutive bleaching and recovery events, cryptic Symbiodinium, Cladocopium, and Durusdinium species (formerly clades A, C, and D, respectively) were also detected and often persisted through recovery (Supplementary Table 3). Symbiodinium spp. were detected in cryptic low abundance (<0.01–5.38%) from April 2014 through December 2014 and then not thereafter at Pickles site (Upper Keys). At the Coffins site (Middle Keys), Symbiodinium spp. were detected intermittently through both bleaching and recovery events. At Marker 32 (Lower Keys), Symbiodinium spp. were detected in April 2014 and persisted at cryptic low abundance though April 2016 (≤0.2%). Cladocopium spp. were only detected from April to October 2014 and then not after at the Pickles site (Supplementary Table 3). Cladocopium spp. were detected at Coffins after the first bleaching in September 2014 and persisted intermittently during recovery until November 2015. At Marker 32, Cladocopium spp. were detected at cryptic levels in the April 2014 baseline sampling (<0.001%) and persisted through April 2016 (0.21% abundance). A single OTU, classified as Durusdinium sp. and identified by BLAST-search as type D1a (putatively D. trenchii, formerly S. trenchii), was first detected in cryptic low abundance at Pickles and Coffins sites in October 2014 after the 2014 bleaching event and then intermittently through the second bleaching and recovery period until January 2016 (Supplementary Table 3). At Marker 32, Durusdinium sp. was detected pre-bleaching in April 2014 and then intermittently throughout both bleaching and recovery periods through April 2016. Research over the last two decades has documented the influence of the symbiont composition and the dynamic processes of symbiont repopulation during the coral response to single episodes of hyperthermal stress events, followed by years of normal environmental conditions (Edmunds et al., 2014; Kemp et al., 2014). Our study characterized changes in symbiont species within some colonies of Dendrogyra cylindrus in response to a consecutive hyperthermal event. This study contributes to further understanding how coral-algal mutualisms may respond through shifts in partnerships under long-predicted environmental scenarios (annual bleaching) (Hoegh-Guldberg, 1999; Grottoli et al., 2014), which coral reefs worldwide are now experiencing (Hughes et al., 2017). Our findings show unexpectedly diverse assemblages of Symbiodiniaceae associated with Dendrogyra cylindrus, and that one low abundant host-compatible species was not a transient associate but persistent and ecologically relevant symbionts that plays a role during thermal stress. Furthermore, site-specific shifts in Symbiodiniaceae species dominance were associated with greater bleaching resistance during consecutive hyperthermal events. By revealing a Symbiodiniaceae community represented by 266 OTUs, with the majority in very low relative abundances (<0.1%), our findings indicate that past studies have considerably underestimated the actual diversity of endosymbionts associated with D. cylindrus, and likely many other coral species, although at least some of these rare and cryptic OTUs may in fact be sequencing artifacts (Arif et al., 2014). Most symbiont types detected in our study (>99%) belonged to the genus Breviolum spp. (formerly clade B). Three other genera, Symbiodinium, Cladocopium, and Durusdinium (formerly clades A, C, and D, respectively) were detected at extremely low levels (0.001–5.38%) in D. cylindrus. Discovery of this tremendous sequence diversity within the genus Breviolum associated with D. cylindrus opens new questions regarding whether these symbiont types are the reflection of population variability within species or are indeed independent evolutionary lineages (i.e., species). Symbiont assemblages across sites and within individual D. cylindrus colonies were dominated by a single Breviolum species of endosymbiont. Using single copy microsatellite markers (see Materials and Methods), it was confirmed that this symbiont corresponded to the recently described Breviolum dendrogyrum (Lewis et al., 2018). Furthermore, low concentrations of Breviolum meandrinium, which was also identified and confirmed with the use of diagnostic microsatellites, increased in relative abundance as a function of environmental stress. Breviolum meandrinium is common to corals in the family Meandrinidae from shallow habitats (1-10 m) across the Greater Caribbean. Dendrogyra cylindrus is one notable exception of the family in that it harbors a unique host-specialist, which appears adapted to associating only with this host. These findings highlight how a host-generalist, B. meandrinium, normally rare in D. cylindrus, can proliferate in colonies subjected to severe thermal stress. It has been suggested that most cryptic Symbiodiniaceae are transitory and likely provide minimal ecological significance for their coral hosts (Lee et al., 2016). However, recent studies have challenged this view and suggested that rare symbionts tend to be non-random clusters of coral host-symbiont communities and may provide environmental resilience for the coral holobiont (Ziegler et al., 2015, 2017). In agreement with this, our data show a clear association between a site-specific increase and persistence in relative abundance of the low abundance background B. meandrinium and the overall stability of the host–symbiont community during subsequent hyperthermal stress. At the Pickles site in the Upper Keys region of the Florida Reef Tract, B. meandrinium increased in relative abundance during the first hyperthermal bleaching event in 2014 and rapidly switched to become the dominant symbiont during the first 7 months of recovery (Figure 6A and Supplementary Table 3). This change in the relative abundances of two species persisted for at least 11 months under normal conditions, but by September 2015, B. dendrogyrum displaced B. meandrinium as the dominant symbiont. This reversal of endosymbiont assemblages is consistent with other studies that have monitored changes before and after non-recurrent hyperthermal events, where changes in symbionts during bleaching episodes reverted to the original state after several months or even years (Thornhill et al., 2006; Sampayo et al., 2008; LaJeunesse et al., 2009b; Grottoli et al., 2014). Nevertheless, the reversion to the normal symbiont in D. cylindrus was short-lived as B. meandrinium again become the dominant symbiont species among colonies at the Pickles site in response to the second hyperthermal event in August–September 2015. These host-symbiont combinations persisted and, at the time of the last sampling for this study in April 2016, B. meandrinium remained the dominant species (Figure 6A and Supplemental Table 3A). Importantly, corals at this site did not lose color during this second event (Figure 5); the relative abundance of B. meandrinium was 3–4 times higher during the onset of the 2015 hyperthermal event in comparison to pre-bleaching levels in April 2014. Under scenarios of annual hyperthermal bleaching events, impacted coral communities may not have sufficient time to fully recover their stable host-symbiont pairings. The Adaptive Bleaching Hypothesis posits that when corals bleach, they expel less thermally tolerant endosymbionts and then acquire new, more favorable endosymbionts, allowing them to acclimatize and adapt to environmental stressors (Buddemeier and Fautin, 1993; Baker et al., 2004; Buddemeier et al., 2004). Berkelmans and Van Oppen (2006) demonstrated that thermal stress may induce changes in the dominant symbionts among experimental corals, thus providing thermal tolerance and decreased mortality to the coral animal, supporting the hypothesis that the presence of a thermally tolerant endosymbiont, even in low abundance, may impart an ecological advantage to their coral host (LaJeunesse et al., 2009b). Sampayo et al. (2009) demonstrated that shifts in dominance between closely related species in the genus Cladocopium can also impart differential thermal tolerance and, ultimately, differential colony survival. However, unusual host-symbiont partnerships that emerge during bleaching events revert to the original state after normal environmental conditions return (Stat et al., 2009). It appears that during a scenario of hyperthermal stress events, followed by multiple years of less-stressful environmental conditions, new host-symbiont combinations that appear following the bleaching event are short-lived and the Symbiodiniaceae community eventually reverts back to its original state (Berkelmans and Van Oppen, 2006; Sampayo et al., 2008). This is likely as normal host-compatible symbionts are more effective at growing inside their hosts under non-stressful conditions (Jones and Berkelmans, 2010). However, under sustained disturbance events, such as annually recurring hyperthermal events, new thermally tolerant partner pairings may be longer-lived and maintain higher relative proportions within the Symbiodiniaceae community as the period of less-stressful environmental conditions between disturbances becomes shorter (Grottoli et al., 2014). Such was the case at the Pickles site where relative abundance of B. meandrinium remained near 50% and, while trace amounts of Durusdinium persisted through April 2016, Symbiodinium sp. and Cladocopium sp. disappeared altogether (Supplementary Table 3A). Our data did not show a shift in dominance at the other two sites (Figures 6B,C) and, unlike Pickles colonies, they bleached again during the second hyperthermal event in August-September 2015 (Figure 5). However, at the Coffins site (Middle Keys), we detected an increase in relative abundance of B. meandrinium to 20.39% during the second hyperthermal event (August–September 2015; Figure 6B and Supplementary Table 3B), which was associated with only paling in most colonies at this site (Figure 5 and Supplementary Table 4). While B. meandrinium did not become the dominant Symbiodiniaceae species, perhaps some threshold abundance may also impart at least partial bleaching resistance for the coral animal (Bay et al., 2016), as was observed at the Coffins site. The Lower Keys site (Marker 32) showed minimal fluctuation in the endosymbiont community but also bleached more severely and recovered more slowly after both bleaching events. This difference across sites seems not linked to different temperature profiles during the two hyperthermal events, since all sites experienced similar exposure to elevated temperatures above the 30.5°C bleaching threshold for the FRT (Figures 3, 4). While we cannot explain why the shift of Symbiodiniaceae assemblages did not occur across all sites, it is important to note that baseline abundance of the cryptic B. meandrinium prior to the first hyperthermal event in April 2014 was higher in Pickles colonies than the other two sites (Supplementary Table 3). Perhaps some critical minimum abundance may be required for a rare symbiont to out-compete dominant symbionts when the opportunity arises, such as during bleaching and recovery. However, the relative abundance of B. meandrinium in Coffins colonies was higher (20.15%) prior to the second hyperthermal event and still we did not see a shift in symbiont assemblages during the second bleaching and recovery event at this site. This suggests the existence of other site-specific factors influencing the dynamics and competition processes of symbiont repopulation after environmental stressors. Alternatively, genotypic differences in the coral animal may contribute to the observed differential symbiont flexibility, but their role is thus far unknown. Recent work on genetic diversity in Florida’s D. cylindrus population indicates that each of these three sites is represented by unique coral genotypes (Chan et al., 2018). All colonies at the Pickles site comprised one genotype, indicating a high level of clonality at this local. The same pattern of clonality was also detected for colonies at the Coffins site. The Marker 32 site had the most genetic diversity, composed of five different coral animal genotypes, and yet was the population most affected by these hyperthermal events. Continued work on the role of genetic diversity in the coral host and its symbiont requires further investigation. It has been proposed that colonies exposed to moderate thermal stress are better conditioned to dealing with episodes of severe thermal stress (Oliver and Palumbi, 2011; Ainsworth et al., 2016). Thermal profiles showing a pre-bleaching spike in water temperatures, followed by a recovery period of cooler temperatures, prior to a hyperthermal event, reduced the severity of bleaching. Temperature profiles at our three study sites show a similar sub-bleaching spike in water temperatures in June 2014 and May 2015 (Figure 3B), however, severe bleaching occurred in August–September both years. This may be due to the recovery period being too short or the ensuing hyperthermal stress was too severe (i.e., temperatures exceeding the bleaching threshold for too many weeks, Supplementary Table 1), exceeding the capacity of the thermally primed corals. As predicted by Ainsworth et al. (2016), climate change leading to annual bleaching and excessive thermal stress may indeed disable this protective thermal priming scenario. Our data support that under certain circumstances, a low abundant symbiont may emerge during thermal bleaching and/or recovery to enhance acclimatization of the coral host (Kemp et al., 2014). Durusdinium sp., known to be opportunistic in certain Caribbean corals exposed to stress (LaJeunesse et al., 2009b), remained at trace levels (<0.03%) during the 2014 and 2015 bleaching and recovery events on the FRT. Due to the high resolution of this study, this is the first reporting of Durusdinium trenchii (formerly Symbiodinium trenchii) in Dendrogyra cylindrus, suggesting an expansion of this invasive, more thermally tolerant species into another Caribbean coral host (LaJeunesse et al., 2010, 2014; Wham et al., 2011). Durusdinium trenchii is a stress-tolerant species within the genus Durusdinium, commonly found in the Indo-Pacific and known to impart thermal tolerance and bleaching resistance to its coral host (Pettay and Lajeunesse, 2009). This species is considered invasive in the Greater Caribbean and has been increasingly found in corals inhabiting marginal habitats or under high environmental stress, particularly after bleaching events (Pettay and Lajeunesse, 2009). One of three cryptic Symbiodinium OTUs detected in D. cylindrus and identified putatively as Symbiodinium necroappetens (strain A13), is considered an opportunist, emerging transiently to associate with thermally stressed or diseased corals (LaJeunesse et al., 2015). Our data show that Symbiodinium spp. were part of the cryptic community in D. cylindrus even prior to the 2014–2015 thermal events (April 2014; Supplementary Table 3). At sites showing an increased abundance of B. meandrinium in response to annual thermal events (Pickles and Coffins), Symbiodinium and Cladocopium genera were not detected, and may have been displaced as B. meandrinium approached 20% relative abundance. Alternatively, the occurrence and persistence of cryptic symbionts in D. cylindrus and other Caribbean corals may also be an indicator of long-term physiological stress due to deteriorating environmental factors, e.g., water quality (Boyer et al., 1999; Boyer and Jones, 2002; Wagner et al., 2010) and pulsed thermal events (i.e., previous Florida Reef-wide bleaching events in 1987, 1990, 1997, 1998, 2005, as well as other localized bleaching episodes (Manzello et al., 2007). While it is encouraging to substantiate that coral symbioses respond ecologically and thus “acclimatize” to a changing climate through shifts in the dominant symbiont partner, it may not be enough for their long-term survival in the Anthropocene. As annual thermal bleaching is predicted to become more prevalent on many reefs in the coming decades, the collateral damage to biological, physiological, and immunological functions of the coral holobiont (Bellantuono et al., 2012; Pinzón et al., 2015) may negate their innate ability to acclimatize. It is imperative that we address the issues of environmental stressors in the hopes that at least some reef ecosystems will be able to acclimate and survive in a changing climate. Even this glimmer of hope for survival may prove to be ‘too little, too late’ as alarming coral losses due to escalating disease outbreaks in warming oceans may overcome these slow-growing monarchs of the reef more quickly than they can adapt. Water temperature data at Pickles, Coffins, and Marker 32 sites: NSF RAPID project 637743 https://www.bco-dmo.org/dataset/699988. 10-year mean monthly water temperatures: National Data Buoy Center, Molasses Reef C-MAN station MLRF1 data: https://www.ncbi.nlm.nih.gov/sra. Cp23S-Illumina Sequencing: all fastq files deposited in NCBI Sequence Read Archive – BioProject #PRJNA513329. CL conceived experimental design and sampling strategy, site selection, sampling methodologies for fieldwork, sample processing and data analysis, manuscript preparation including figures and tables, and reviewed manuscript drafts. KN contributed site selection, field assessments and dive support, assisted with tables and figures, and reviewed manuscript drafts. MR-L conceived experimental design and sampling strategy, financial support, manuscript preparation, and reviewed the manuscript drafts. This research was supported by US National Science Foundation Rapid Response Research (NSF RAPID) grant #1503483 (to MR-L and Laurie L. Richardson) and conducted under Florida Keys National Marine Sanctuary permits FKNMS-2014-004-A1 and FKNMS-2013-085-A1. We thank the Florida Keys Marine Laboratory, Long Key, FL, United States and Florida Fish and Wildlife Conservation/Fish and Wildlife Research Institute, Marathon, FL, United States for logistical support, and scientific divers from KML, FWRI, and FIU for assistance with fieldwork. We also thank A. Lewis and T. LaJeunesse (Pennsylvania State University) for Symbiodiniaceae species confirmation. This is contribution number 363 from the Tropical Biology Program of Florida International University. Aronson, R., Bruckner, A., Moore, J., Precht, B., and Weil, E. (2008). Dendrogyra cylindrius. Cambridge: The IUCN Red List of Threatened Species 2008. Boyer, J. N., and Jones, R. D. (2002). A View From the Bridge: External and Internal Forces Affecting the Ambient Water Quality of the Florida Keys National Marine Sanctuary (FKNMS). The Everglades, Florida Bay, and Coral Reefs of the Florida Keys: An Ecosystem Sourcebook. Boca Raton, FL: CRC Press, 609–628. Causey, B. (2001). “Lessons learned from the intensification of coral bleaching from 1980–2000 in the Florida keys, USA,” in Proceedings of the Workshop on Mitigating Coral Bleaching Impact through MPA Design, Honolulu, HI, 60–66. Ehrenburg, C. G. (1834). Beitrage zur physiologischen Kenntniss der Corallenthiere im allgemeined, und besonders des rothen Meers, nebst einem Versucch zu physiologishen systematic derselben. Phys. Abh. Konigl. Akad. Wissech. Berlin Jahar. 1832, 225–380. Fisheries, N. O. A. A. (2014). Endangered and threatened wildlife and plants: final listing. Fed. Regist. 79:175. Lewis, A., Chan, A., and LaJeunesse, T. (2018). New species of closely related endosymbiotic dinoflagellates in the greater caribbean have niches corresponding to host coral phylogeny. J. Eukaryot. Microbiol. doi: 10.1111/jeu.12692 [Epub ahead of print]. Liu, G., Strong, A. E., Skirving, W., and Arzayus, L. F. (2006). “Overview of NOAA coral reef watch program’s near-real time satellite global coral bleaching monitoring activities,” in Proceedings of the 10th International Coral Reef Symposium (ICRS), Honolulu, HI, 1783–1793. Copyright © 2019 Lewis, Neely and Rodriguez-Lanetty. This is an open-access article distributed under the terms of the Creative Commons Attribution License (CC BY). The use, distribution or reproduction in other forums is permitted, provided the original author(s) and the copyright owner(s) are credited and that the original publication in this journal is cited, in accordance with accepted academic practice. No use, distribution or reproduction is permitted which does not comply with these terms.